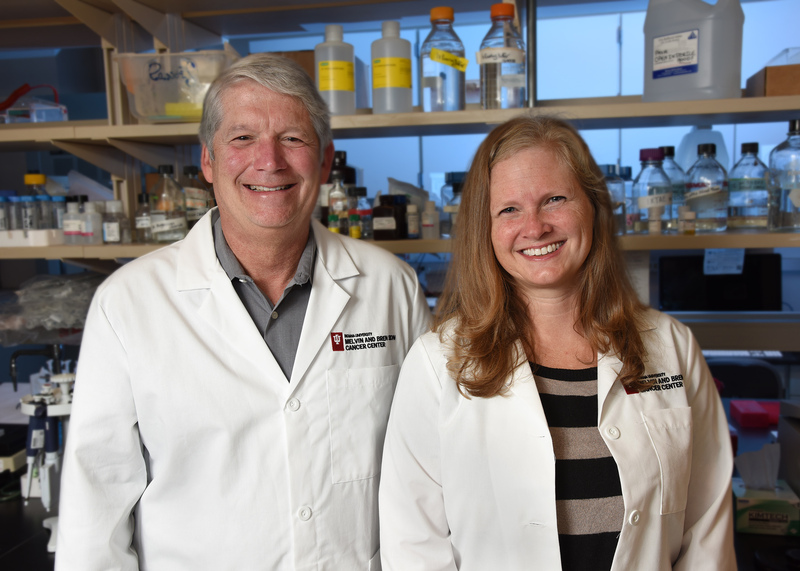 Indiana University cancer researchers who have been working to lessen the debilitating side effects caused by chemotherapy have been awarded $2.3 million to continue their studies. Jill Fehrenbacher, PhD, and Mark Kelley, PhD, are recipients of the five-year grant (1R01CA231267) from the National Cancer Institute, which will enable them to continue their studies on chemotherapy-induced peripheral neuropathy, or CIPN. The duo and their colleagues will test the effectiveness of a small, targeted molecule called APX3330 to prevent or reverse CIPN caused by cancer drugs in tumor-bearing mice. Although cancer treatments are becoming more effective and people are consequently surviving cancer in increasing rates, many patients report neuropathy — a nerve problem that causes pain, numbness and tingling in the hands and feet and muscle pain and weakness. As many as 30 to 60 percent of cancer patients say they experience neuropathy. Neuropathy can become severe enough for some patients that their treatment needs to be reduced or stopped. The effects also can linger well beyond the course of the treatment. In 2017, Kelley, associate director of basic science research at the IU Simon Cancer Center, was first awarded a $2.9 million grant (1R01CA205166) from the National Cancer Institute to study CIPN. Fehrenbacher is also a co-principal investigator of that initial grant. That grant was awarded because Kelley, Fehrenbacher, and colleagues had previously demonstrated in the lab that increasing the repair activity of a protein called APE1/Ref-1 decreased neurotoxicity. The aims of the 2017 grant are to study, in detail, the mechanisms by which APE1 alters the function of the sensory neurons. Interestingly, they also found that APX3330 was effective in reducing APE1’s ability to facilitate the growth and spread of tumors in mice models, therefore this new drug has the potential to block the advancement of cancer and CIPN. “It’s very rewarding to receive funding for these studies from the NCI in continued support of our efforts to further advance APX3330 for anti-CIPN studies, both in the lab as well as in the clinic,” Kelley said. The National Cancer Institute awarded both grants as part of its Provocative Questions initiative, a program aimed at promoting cancer-related research on important yet understudied areas or research questions that have proven difficult to address. Melissa Fishel, PhD, and Karen Pollok, PhD, scientists from the cancer center’s Tumor Microenvironment and Metastasis research program, are collaborators on this study as is Theodore Cummins, PhD, an electrophysiologist in the School of Science at IUPUI.